Zingrone, Frank D.. "Marshall McLuhan". The Canadian Encyclopedia, 25 July 2017, Historica Canada. https://www.thecanadianencyclopedia.ca/en/article/herbert-marshall-mcluhan. Accessed 20 April 2019. Herbert Marshall McLuhan, communication theorist (born 21 July 1911 in Edmonton, AB; died 31 December 1980 in Toronto, ON). Professor of English at the University of Toronto, McLuhan became internationally famous during the 1960s for his studies of the effects of mass media on thought and behaviour. 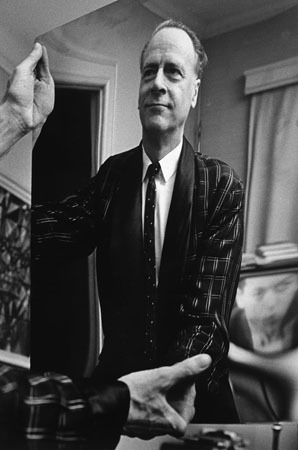 A portrait of Marshall McLuhan, looking into a mirror, circa 1967 (photo by John Reeves, courtesy Library and Archives Canada/PA-165118). Marshall McLuhan at the Coach House on the University of Toronto campus, circa 1950s (courtesy Robert Lansdale Photography, University of Toronto Archives). Herbert Marshall McLuhan, communication theorist (born 21 July 1911 in Edmonton, AB; died 31 December 1980 in Toronto, ON). Professor of English at the University of Toronto, McLuhan became internationally famous during the 1960s for his studies of the effects of mass media on thought and behaviour. Trained in literature (PhD, Cambridge, 1943), he laid the basis of his later work in his erudite dissertation "The Place of Thomas Nashe in the Learning of his Time." McLuhan thought of himself as a grammarian studying the linguistic and perceptual biases of mass media. A deeply literate man of astonishingly wide reading, he gravitated intellectually to the cutting edge of modern culture, where the "irritation," he said, was greatest. His contribution to communications has been compared to the work of Darwin and Freud for its universal significance. Still, he was misunderstood by many because of his revolutionary ideas and their expression in an aphoristic prose style. He emphasized the connectedness of things and built what he called "mosaic patterns" of meaning, rather than offering mere argument using one-dimensional specialist logic. McLuhan studied changes in perception created by electric media competing with print and machine process, the old strategy of fragmenting reality into informational categories. With the integrating, interdisciplinary force of electric process, information shifts its focus from specialist emphasis on detail towards a need to interpret the contexts created by media forms. The environment, overloaded with detailed information, can be ordered meaningfully, McLuhan said, through enhanced pattern-recognition skills, the ability to deal with open systems undergoing continual change at electric speed. He stressed how electric processes decentralized information, bringing simultaneous awareness to every point in a network. The perception of reality then becomes dependent upon the structure of information. Marshall McLuhan's famous distinction between "hot" and "cool" media referred to the different sensory effects associated with media of higher or lower definition. High-definition ("hot") media, such as print or radio, are full of information and allow for less sensory completion or involvement on the part of the reader or listener than low-definition ("cool") media, such as telephone or television, which are relatively lacking in information and require a higher sensory involvement of the user. The form of each medium is associated with a different arrangement, or ratio, in the order among the senses and thus creates new forms of awareness. These transformations of perceptions are the bases of the meaning of the message. In this sense, "the medium is the message." Controversy always raged around McLuhan's work, for he was initiating a new paradigm which required that we recognize the form our information takes as basic to the way that knowledge is perceived and interpreted. The Mechanical Bride (1951) documents the power of advertising to manage public consciousness. The Gutenberg Galaxy (1962) presents a pattern of insights into the cultural transformation created by print technology. With the publication of Understanding Media (1964), McLuhan's reputation became worldwide. Of the several books that followed, War and Peace in the Global Village (with Quentin Fiore, 1968), The Interior Landscape: The Literary Criticism of Marshall McLuhan (collected, 1969), Counterblast (1969), From Cliché to Archetype (with Wilfred Watson, 1970), and Take Today: The Executive as Dropout (with Barrington Nevitt, 1972) are the most important. A resurgence of interest in McLuhan's prescient work began in the early 1990s and is still growing as the relevance of his vision is increasingly borne out by cultural events created by the interplay of electric technologies. For example, the pattern of contemporary world conflict reminds us of McLuhan's discovery that the main effect of electric process is to "retribalize" the structure of social and psychic awareness, which stresses traditional identities to the point of violence. He warned that the Global Village would not be a peaceful place. Also he understood and described the effects of the coming Internet and Virtual Reality as early as 1964. He forecast what he called "discarnate experience" flowing from relationships developed solely on electronic bases. Numerous international honours and awards were bestowed on McLuhan, including the Schweitzer Chair (1967), which he spent at New York's Fordham University. 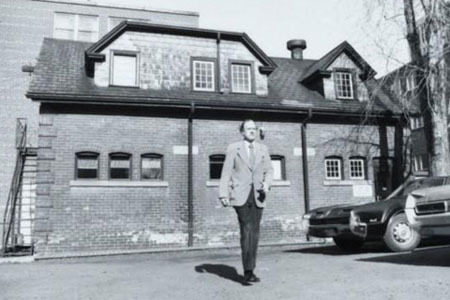 The University of Toronto's former Centre for Culture and Technology, which he founded and which was known as "The Coach House," is now the McLuhan Program for Culture and Technology within the Faculty of Information, with a research unit - the Coach House Institute. Further, a special McLuhan Collection was founded at the U of T Faculty of Information Science in March 1995. The McLuhan Teleglobe Canada Award, under the aegis of UNESCO, was created in 1983 in honour of his pioneering work in Communications, and awarded for over two decades. McLuhan was named a Companion of the Order of Canada in 1970. See alsoMarshall McLuhan's Legacy in Culture and Scholarship. Douglas Coupland, Marshall McLuhan (2009); W. Terrance Gordon, Marshall McLuhan: Escape into Understanding: A Biography (1997); A. Kroker, Technology and the Canadian Mind: Innis/McLuhan/Grant (1984); William Kuhns, "The Sage of Aquarius," in The Post-Industrial Prophets (1973); Philip Marchand, The Medium and the Messenger (1989); Eric McLuhan, Frank D. Zingrone, eds, Essential McLuhan (1995); Marshall McLuhan and David Carson, The Book of Probes (2003); Matie Molinaro, William Toye and Corinne McLuhan, eds., Letters of Marshall McLuhan (1987); Raymond Rosenthal, ed, McLuhan: Pro and Con (1969); G.M. Stearn, ed, McLuhan: Hot and Cool (1967); Lance Strate and Edward Wachtel, eds., The Legacy of McLuhan (2005); D.F. Theall, The Virtual McLuhan (2001). An ELECTRONIC MONUMENT to MARSHALL McLUHAN: Recapturing Canadian IdentityThis article focuses on the origins of the Heritage Minutes series and the making of the Heritage Minute episode on Marshall McLuhan (scriptwriter Patrick Watson and director Al Waxman). From McLuhan Studies at University of Toronto. Extraordinary Canadians: Marshall McluhanCheck out Douglas Coupland’s biography of Canadian communications guru Marshall Mcluhan at the Indigo website.